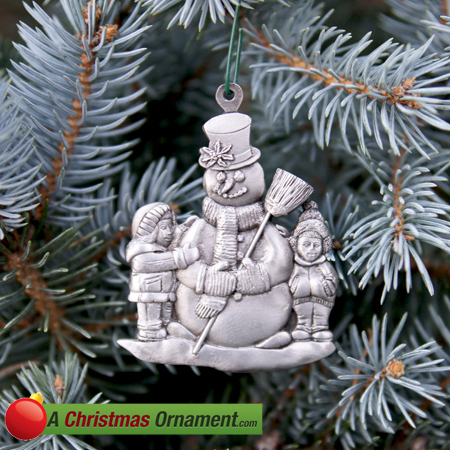 Christmas Ornaments Made in USA - Pewter Snowman and Children Ornament - A Christmas Ornament Co.
What holiday season is complete without a snowman? This classic winter scene shows two children bundled up in their snow clothes playfully making the perfect holiday snowman. With a carrot for a nose and coal for eyes and buttons, this snowman comes equipped with a scarf, broom, and mittens to go along with perhaps a magical top hat. The Snowman and Children ornament is hand-crafted in the United States and has a plaque on the back perfect for personalization. This fine pewter Christmas ornament stands 2-1/4" tall by 1-3/4" wide and will bring holiday cheer to the entire family for years to come.